Developer Quote: "PuXXles - a totally new way of communication! Download PuXXles and create jigsaw puzzles, text, visual riddles, and more to send encrypted messages to whomever you want!" Corresponding with friends and family is so simple and easy nowadays. It used to be that you could only reach your family via phone, and if they lived overseas you'd be paying for one little phonecall for the entire month! We have it easy these days with loads of social network options. You can use text, Skype, Facetime,and many other such communication methods to stay in touch or make new connections. 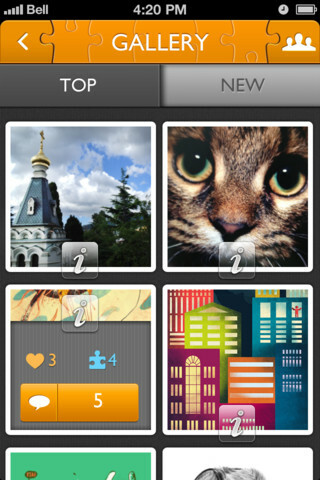 ● Use any picture to create a puzzle or make a text riddle! 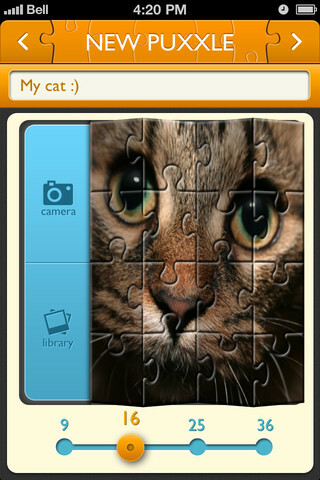 Find lots of puzzle and riddle options to encode messages and turn social interactions into an exciting game. ● Create clever puxxles for users to solve. 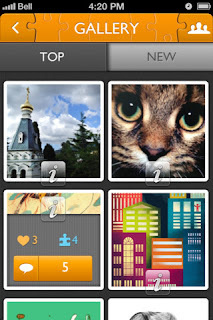 ● Post your puxxles at the Gallery and watch them climb up to the TOP. Grow as a puxxle artist! ● Turn your everyday shoutouts, news, and statuses into something extraordinary - make them puzzling and perplexing with PuXXles! ● Flexible privacy and connectivity options let you share and receive puxxles from only those you choose. So what exactly are puxxles and how on earth do you create and send them? Well, they are actually messages, but not just words simply typed out. In fact, each message is delivered as a trivia question or jigsaw puzzle. But it's not that simple! When you get a puxxle, as excited as you may be to read this secret message, you can only see it when you solve the riddle or put the pieces of the puzzle together! To return the favor, you may want to send a friend a hot picture of yourself, or (to tame it down a bit) maybe a picture of your child, pet or great scenery. You can send music or even crazy jokes you've heard around the water cooler at work. 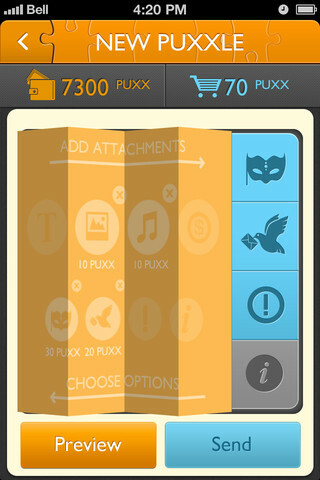 You can become an avid PuXXles fan by sharing your own puxxles and saving favorites. Create a profile, and if you are proud of your puxxles, go ahead and post them at the Gallery for others to enjoy your encoding creativity. Stay on top of things by selecting the options which alert you when your own puxxle has been opened and setting privacy options! Login to PuXXles with your Facebook profile, or open a new PuXXles account. The app will give you a brief demonstration of how to get into the swing of things. 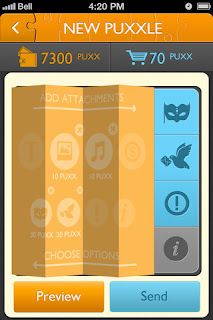 Then launch the Home Screen where you can tap buttons for Puxxlers (search for your friends using PuXXles or invite friends), set up your profile, check out the Ratings of other Puxxlers, adjust your Settings, and enter any Activation Codes you may have received in order to open puxxles delivered to you. As a new game player, you will be labeled a Chatterer, but this title will change as you become more adept in your puxxle making! When you're ready to make a new puxxle, tap the orange puzzle piece in the bottom right of your screen. A "T" or puzzle icon will appear in a jigsaw piece. If you want to send a written puxxle, tap the "T", but if you want to send a jigsaw puzzle of your fave pic, tap the puzzle icon. Enter a question and its answer when you use the "T" option, then follow the instructions to send your new puxxle. If you want to send a pic, choose which size puzzle from 9 to 36 piece, add an image from your library or snap a new photo, name your puxxle, add text if you wish as well as a song or your own recorded words and send off your new and intriguing puxxle to your friend via email, SMS or to other Puxxlers. Producing puxxles is so much more fun and captivates the recipient like nothing else! If you love puzzles, a bit of mystery, plus social networking with friends, you'll get all of these cool treats with PuXXles! COOL CONCLUSION: A sharp wit, a love of challenges and solving puzzles is what it takes to use PuXXles, a most unique and creative social networking and messaging app.